The compact and handy base model was specifically designed for indoor applications. Shortcut keys for addition, subtraction, area and volume calculation make measuring fast and very reliable. 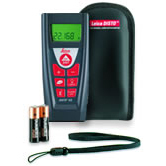 As with all Leica laser distance meters, the laser dot is clearly visible. You can always see your targeting point even if the target object is in a hard to access areas. Its easy to hold due to its compact but ergonomical size and fits into every pocket. It could not be any easier - point the laser bam at the target , press the DIST-key and read the measured value. Makes measured values easy to read, even in the dark. The instruments is easy to hold, all keys are ergonomically arranged. The display shows the preset distance and its multiples. A beep is sounded whenever such a distnace point is reached. Measuring the distnace and calculation of the dimension and volume in the interior, painting, tile, fire-fighting appliances, wallpaper, floor covering and etc.